I'm new here, so I figured I'd start a thread to share my fan arts with the rest of you great people! I recently started a channel on Youtube as DCLegendia also... I know we're not allowed to post links as newbies, but feel free to look me up on Youtube if you'd like to see how I draw my pics. Raphtalia! If you're only watching the show, you may not know that she turns into an adult fairly early on, by leveling up. So think this outfit hasn't appeared in the show yet. Actually, I was looking at one scene of the movie, and thought this image looked pretty good. So I decided to basically "redraw" that screenshot. Well... Obviously, I had to make up a lot of stuff, because it's cropped way too closely to make a drawing out of it. Not sure that I like the perspective on the arm, it may be a little bit too big, so I'll re-work that as well, along with a bunch of other stuff that doesn't look too great right now. Yeah... it's just a sketch. Make sure you let me know if you catch anything else that looks weird so I can fix it before I ink it. sketches always seem to be that tad more dynamic than the finished pieces, you can really feel the energy from the pose and face. your face proportions also seem a tad more believable than the original, although DragonBall isn't in what I would call a fantastically realistic style. other than Tatsumaki I don't know any of the other characters, but they all look fantastic! That is so true about the sketches being more dynamic! I'll try to keep that energy in the finished piece. For now, here's the first pass at inking... still a long way to go but I like posting WIPs, so there it is! I guess I'll be posting the videos of this at some point in February, in case anyone is into Youtube videos. I'm digging these! Yeah if you haven't already, point us towards the youtube channel dude! There aren't that many videos for now, because it takes a lot of time just to edit. I hate it, because I could be drawing instead. But if I want the videos to happen, there's no other way! Anyways, the inking is done for now... I guess I'll probably refine the lines as I color it, but this is it for now. Well, here's a version I cropped so that it would be more zoomed-in and people could see the details more. I'm editing this video now, should be up in a few weeks because I'm planning on posting the Cheelai next week (the green girl). Or should I just go with this one, and do Cheelai later? Which one is more interesting? 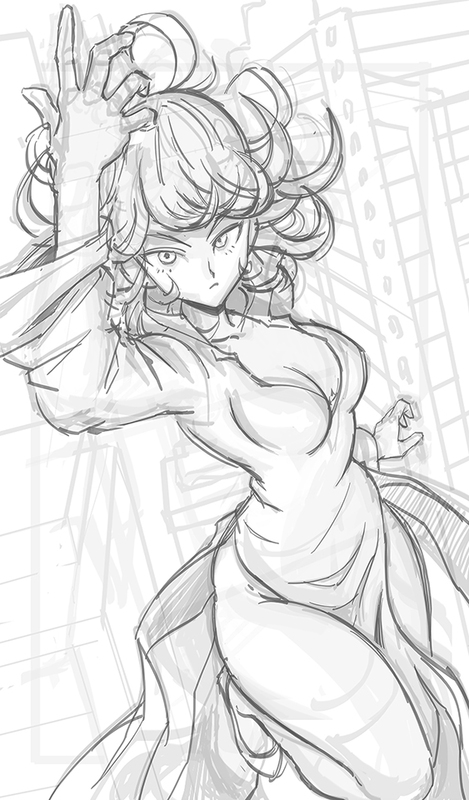 Sketch for Tornado from OnePunchMan! Yeah, I'm drawing her again! Let me know if you see anything weird so I can fix it! 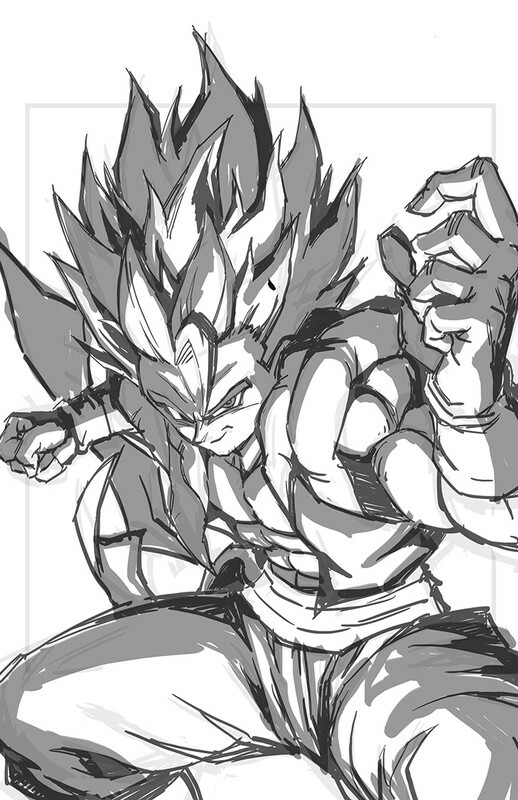 BTW, I've also got the Gogeta coloring video coming out tomorrow morning, if anybody is interested. I think your pieces have a sort of unfinished quality to them with a lot of the brush strokes quite visible (especially around the breasts on a couple of pieces), is that your art style or do you plan on getting future pieces even more sharper on the shade/colouring detail? @calibur keep drawing and you will improve, no doubt! Though it is just a hobby, I do try to keep the quality as high as I can :) I am sure that you will be just as good if you practice often! The brush strokes are done like that to give a kind of painted look rather than looking too smooth like CGi. Especially on large areas since it makes them look like there's more going on than if it was just all-the-way-smooth. But if people start saying that I should smoothen them a bit more, I can try that next time. At the moment, I'm trying to find the best way to edit videos so that they're easy to follow. With the inking ones especially, I zoom in and spin the canvas a lot, so it's tricky to edit them and find a good speed so that people don't get confused when they watch. ahhh I see yeah the painted feel does give it a bit of texture as opposed to super smooth. I find that as long as the video isn't insanely sped up then it's easy enough to follow, especially with Youtube's 0.5x and 0.25x play speed options. Really someone should be learning their own way to paint and draw, and just use other peoples work as a quick reference, not a step-by-step or join-the-dots kinda of learning, is what I think.